And What About The Right To Die? I’m totally against unnecessary suffering only when it comes to the physical, id est, terminal illnesses, complete paralysis, etc. Don’t get me wrong, if you want to live then fine but what about living and not being able to add quality to your life or the life of others? What if your existence is a burden to your loved one? At this point I would like to make myself clear: I do not support suicide killings/bombings, homicide-suicide, suicide due to depression and/or bullying, I’m totally against violence on any level. I support assisted suicide for the critically ill, brain dead or anything to that effect. If I had a condition which is all about physical pain, constant trips to the doctor, making me dependent on others, I can’t do anything for myself, and it would kill me eventually but years from now (or I die naturally), feeling hopeless, depressed and useless, I would opt for a quick and pain-free death. Call me a coward but the joy in that kind of life is pretty much non-existent and for me, that’s not the way I want to live. In the photograph above, Tony Nicklinson with his wife, Jane, when the judge denied his assisted suicide plea. Does this man looks happy to continue living like that? He can’t even wipe his own tears. 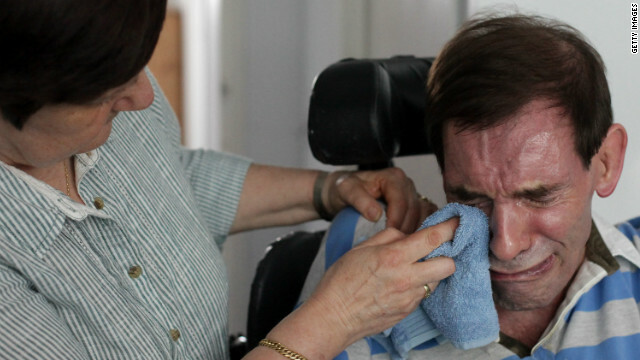 To continue living life in paralysis is a death sentence for him. He’s not getting any younger, he’s probably concerned about his wife’s happiness…I could list a million reasons. the patient may be passively euthanized by stopping medical treatment, chemotherapy, dialysis, artificial respiration, blood transfusion, IV drip, etc. the physician must have (ineffectively) exhausted all other measures of pain relief. Whew! It’s not easy to decide on how and when to kill a person even if he/she is on death row and deserves it. I appreciate the concern and thought put into taking someone’s life especially if they are at a loss in physical health. But I believe that if a person, like Tony, who has reached that point where death is a more favourable option and chooses to do it legally in his/her sound mind, should not be denied the Right to Die.